AS part of an operation lasting two years, the National Police have broken up the largest gang of drug smugglers in the Campo de Gibraltar. 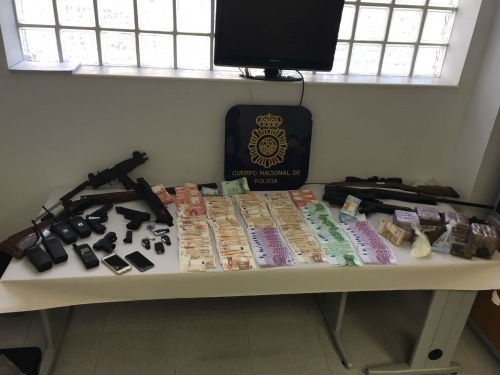 With 150 officers involved and close cooperation with the Moroccan authorities, 30 people of Spanish and Moroccan origin who belonged to a gang known as Los Castañas have been arrested with 21 properties raided. Following the arrests – a number of which took place in Tetuan – the authorities seized 1,000 kilograms of hashish, €350,000 in cash, 16 vehicles, three semi-rigid speed boats valued at €300,000, firearms and 17 properties valued at €3 million together with information on 24 bank accounts. This gang arranged for the regular transportation of hashish from Morocco to beaches on the coast of Cadiz where the drugs were taken to ‘safe houses’ in the district of El Zabal in La Linea de la Concepcion. In order to try to divert suspicion from these properties the gang found poor local families who had no criminal records and installed them in the properties allowing them to live rent free, giving them cars and paying what was effectively a salary provided the drugs could be stored in the houses. According to information obtained during the arrests, those who were responsible for delivering the drugs from the beaches to the houses were under instruction to stop for no one including the police and to use violence if necessary.